Fresh from an involuntary crash course in the Stranger Arts, Ves has a new mystery to solve: the inexplicable reappearance of an extinct species. The Dappledok Pup has not been seen in the flesh since the eighteenth century - so how does one come to be found, weak but alive, over two hundred years later? A creature with a unique talent for sniffing out treasure, no less, and that can’t be a coincidence. Where did the pup come from - and is there something sinister afoot? Aided by a talking book, a spriggan with a taste for vintage fashion and the best Waymaster in the business, nothing can stop Ves from finding out the truth. Can it? Modern Magick - The Striding Spire has not been tagged yet. Help others find Modern Magick - The Striding Spire by tagging it! 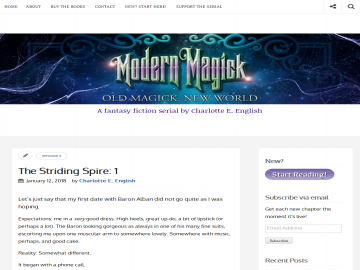 Modern Magick - The Striding Spire has not been reviewed yet. Modern Magick - The Striding Spire has not been recommended yet.